Any applicable engine error codes. Auto - reversing with operator override. Rain, strong winds, heavy cane varieties and seed can all present unique harvesting challenges. The Case IH feeding system can tackle challenging conditions, even in lodged and tangled cane. - Best option for locations where cultivation is required for trash blanketing. - Better suited to top new, heavier cane varieties. - Minimize dirt entrance and harvester wear. - Preserve stools to maximize future yields. The 8000 Series Austoft® Cane Harvester cleaning system uses the Anti-Vortex System, designed and developed by Case IH. This system is the most modern and efficient cleaning system, it reduces extraneous matter and cane loss and dramatically improves the load density for transport, which lowers operating costs. The bin flap directs the cane billet discharge flow into the cart or bin. The optional Auto Tracker automatic basecutter height system uses sensors and the hydraulic suspension system to automatically raises or lowers itself to improve yield. 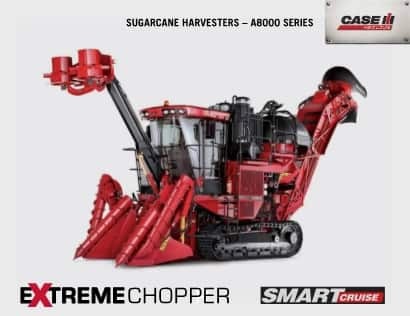 This easy to use system allows you to concentrate on other harvest functions, is available for all Case IH 8000 Series Austoft® cane harvesters, and can be retrofitted for models manufactured since 1999. These results show that the automatic basecutter operation is better or at least equal to operation performed by an experienced employee running the harvester manually. Auto Tracker saves that information and determines the most adequate hydraulic pressure and cut height averages for that area. Case IH Austoft® pioneered the use of hydraulic systems in cane harvesters and has continually simplified and improved efficiency for optimum performance, reduced maintenance, and lower operating costs. A quick-connect port added to the hydraulic oil tank to simplify the fill process. - Ensures efficient, reliable operation. The spacious, two-door, walk-through cab on 8000 Series Austoft® sugarcane harvesters offers unrivaled comfort, visibility and control. When harvest begins, there is no time to spare. The 8000 Series Austoft® cane harvesters are designed for effortless daily service and simple maintenance. Pockets inside doors provide another convenient storage area. The cab tilts 60 degrees to the left-hand side for easy access to the engine and other internal components. Operated by a remote-mounted hydraulic hand pump with pilot check valves for safety.